The Canal & River Trust is a charitable organisation which cares for 2,000 miles of waterways in England and Wales. They run three museums - the Canal Museum at Stoke Bruerne, the National Waterways Museum at Ellesmere Port, and the National Waterways Museum Gloucester. The collection ranges from boats and artefacts to a nationally significant archive - the Waterways Archive - which includes a large photographic collection. The Trust were looking for a system that could combine the object and archive catalogues, and bring together the many and varied listsings in different formats (Word and Excel, with archive data in a CALM system). CollectionsIndex+ had been recommended by a staff member at the British Museum. We supplied the Trust with the Archive and Object modules, in a combined CollectionsIndex+ application. We also built a CollectionsOnline website, for publishing records from CollectionsIndex+ to the web. 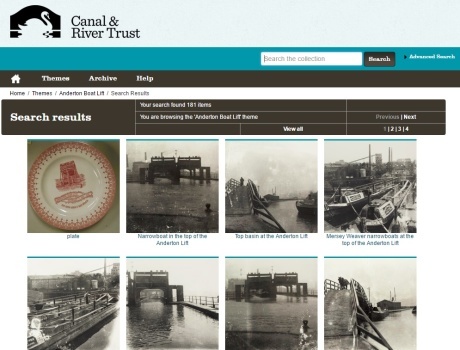 This website is fully integrated with the Canal & River Trust website. CollectionsOnline includes System Simulation's user-comments facility, so members of the public can add a note or comment to any item in the website. This information can then be transferred back into CollectionsIndex+.